TestCafe allows you to debug server-side test code and test behavior on the client. You can debug test code in Chrome Developer Tools and popular IDEs. See the following recipes for details. 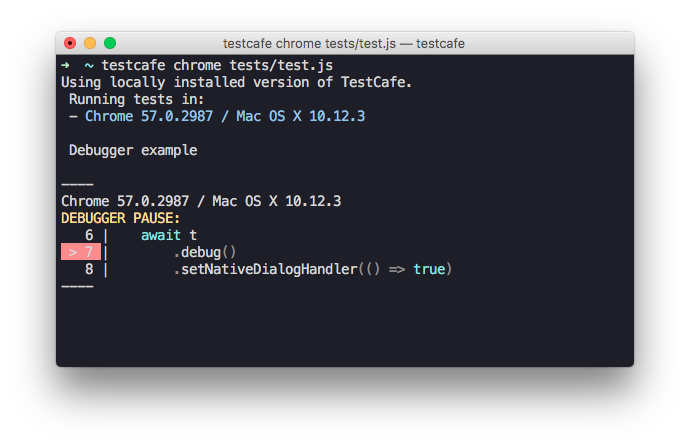 TestCafe provides the t.debug method that pauses the test and allows you to debug using the browser's developer tools. When test execution reaches t.debug, it pauses so that you can open browser's developer tools and check the web page state, DOM elements' location, their CSS styles, etc. You can also use the --debug-mode command line option to pause the test before the first action or assertion. The footer displays buttons that allow you to continue the test or skip to the next test action or assertion. The debugger does not stop at creating and resolving the selectors and client functions. TestCafe includes features that help you locate the cause of issues in your tests. You can specify that a screenshot should be taken in a particular place in a test using the t.takeScreenshot action. You can also turn on the --screenshots-on-fails option to automatically take a screenshot when a test fails. Analyzing these screenshots reduces debugging time and allows you to determine the reason of issues earlier. TestCafe provides the capability to change test speed. Tests are executed at full speed with minimum delays between actions and assertions by default, which can make it hard to identify problems when the test is running. To slow down the test, use the --speed CLI flag. You can use values from 1 to 0.01. When tests run slower, you can monitor test execution and notice when the test's behavior differs from what is expected.